There are two thirattupal .One is prepared by milk (Pal thiratupal) another one is from coconut(Thengai Thirattupal) . Thengai Thirattupal is a traditional tamil iyer sweet . This sweet is must in our weddings. For Vinayakar Chaturthi along with other Neividhyam I made Thengai Thirattupal. Grate only the soft white portion of the coconut. Put the jaggery in a heavy bottomed vessel and add ½ cup water and keep on low flame. When the jaggery completely melted, strain it and put it in a heavy bottomed vessel and allow to boil . Add coconut gratings and Cook till the mixture just starts leaving the sides of the vessel and become solid. Add cardamom powder and & ghee mix well & remove from the heat. Aval Vilayichathu is an all time favourite! It is made with aval, coconut and jaggery as the main ingredients. This is a very delicious snack and nutritious too! IAvil Vilayichathu is served as prasadam in temple sand in home for ganapathi homam/pooja. Dissolve jaggery in one and half cups of water over low heat. Strain. Heat ghee in a pan and fry coconut slivers, sesame seeds and set aside. Add the aval , sesame seeds ,and cardamom powder. Mix well for 2 minutes till the aval is well coated with the jaggery and coconut. Remove from heat and allow it to cool slightly . Note : If we want store more days then don’t add banana. 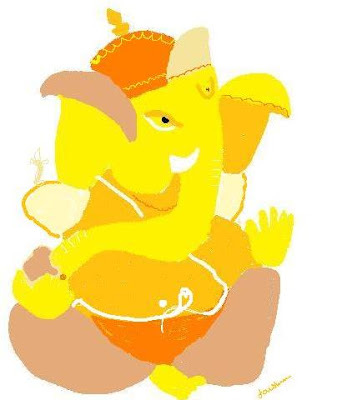 I am sending this both recipe ,One Article Meaning of VinayakaChaturthi ,and my small sketch of Lord Ganesha to Purva's Festive Food Event. Vidhya has tagged me for these questions..Thank you Vidhya....it is my pleasure to do it. 6) Do not tag the same person repeatedly but try to tag different people, so that there is a big network of bloggers doing the tag. 17. Q – Quote for today- Go with the flow. 18. R – Reason to smile? Many; KEEP SMILING not because of something but in spite of everything. 23. W – Worst habit? I believe others easily, so sensitive. Thengai thiratupal looks simply delicious, never tried yet at hom..aval vilayichathu seems very easy and delicious..Nice to know more about you through ABC tag.. WOnderful and delicious jaishree...Nice to know more about you through ABC tag.. Hmm,mouthwatering!! coconut and jaggery makes a great combo!! Thengai thirattu pal ....I m drooling:) Aval vilaichathu recipe is so perfect and I m always looking for this prasadam recipe. Thanks for letting know these delicious recipes. Guess u can write a cook book for those tasty prasadams.. U have a nice collection dear. Bookmarking it.